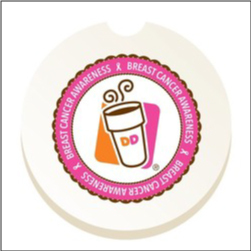 Order custom Imprinted Absorbing Stone Car Coasters – these great coasters absorb condensation from drinks, fitting in most auto cup holders. Ceramic Stone with Digital Print. 2.5inches diameter with imprint 2.13inches. Packed in a poly bag. Order your custom automotive and drink stone coasters today!